In 2017, 504 rhinos were poached from the Kruger National Park. Announcing a breakthrough on Tuesday, the Hawks said two accused, alleged to be kingpins in the movement of rhino horn out of the country, were arrested. The arrests were the culmination of a two-year investigation. 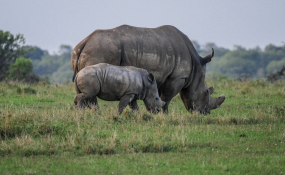 Investigators from the Directorate for Priority Crimes Investigation (Hawks) and their counterparts in SanParks believe they have disrupted the supply chain of poached rhino horn from the Kruger National Park via Gauteng to SouthEast Asia. "We made a paradigm shift in wildlife trafficking and the whole supply chain." Two men, Mandla Patrick Mashele, 37, and Kelvin Hahlane Malapane, 30, handed themselves over to police and have subsequently been released on R50,000 bail with stringent conditions after they made a brief appearance in court. Both men are from Benoni and are alleged to be the masterminds behind acquiring the poached rhino horn from the parks and facilitating its movement to markets in SouthEast Asia.